When you join we will give you a credit-card-style Brownie Points card. Register your card HERE to redeem your rewards, the points will add up every time you use it, but we need you to register the card online to use the reward. Bring your card with you each time you visit, (or go cardless once your account is registered and just give us your phone number!) and hand it to your cashier when you pay your bill so it gets swiped and you earn points from your purchases. We automatically track your purchases and assign points to your account. Each dollar spent equals 1 point in your account. When you accumulate 200 points, a $10 reward will be available on your card, or you can choose to “USE IT LATER”! Plus, you’ll get a special $10 off reward on your card to use during your birthday month, exclusive insider scoop emails, and double or triple points offers that help you earn points and FREE food faster! There are no expiration dates for your accumulated reward points! This is a totally cool, totally FREE program! 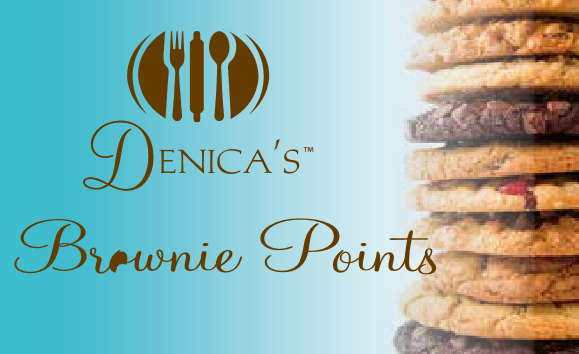 The Brownie Points Club is just one way we thank our many loyal guests!